NYR Organic products are perfect to use in my therapies, as they are made from safe, organic ingredients. In this day and age, our bodies take in many different toxins via the environment, food and our skin. These toxins can play a part in different conditions, such as eczema and by using organic ingredients on our skin, we can reduce the amount of chemicals and toxins we absorb. Would you like to host a NYR Organic social gathering for your friends, in your own home? These events are very popular and you'll get to gather your friends together, to sample some of the Award winnings products. As the host, you'll receive a full sized "host gift" (typically worth £20), special offers, get up to £100 FREE shopping and HALF PRICE shopping, dependent on your guests total purchases. 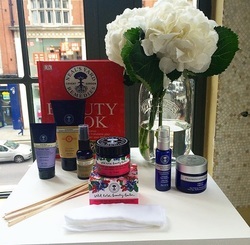 A NYR Organic event is the ideal "girl's night in". Let your friends feel utterly spoilt, with the ultimate personal pampering and shopping experience. All you need to do is, choose a date, invite some friends (maybe suggest they bring a friend), provide some simple refreshments or nibbles and leave to rest to me! Contact me to book a date in my diary. There's never been a better time to join the NYR Organic family. Now you've discovered a healthier way to look and feel great, why not share it with friends, customers or colleagues and receive generous rewards. Be part of something which makes a difference - NO EXPERIENCE NECESSARY! Contact me for more information, about this great opportunity to run your own business. The low cost starter kit is only £95 (with over £200 worth of products) and comes complete with a selection of bestselling products and all the business tools you need, to get you off to a flying start.